source (and don't miss the Maxine Waters classic about 150 million jobs at stake, at the link). Funny how that chart tails off during Clinton and spikes up hard during Bush II. I wonder how much is DHS? Rahm isn't the first one to not let a crisis go to waste. Its Obamageddon - the country will come to halt !! ... or not. Notice too that most of the spike in the Bush years occurred when the Dems took over congress and the senate. early Bush years don't look so bad actually. Also notice how it started going up under Clinton until the GOP took over the house. It looks like the upward trend starts back up in 1996, still four years before junior took over for Clinton. The big spike upwards, as marque2 notes, is in 2006 when the democrats returned to control of congress. Spot on. That said - dear readers and commenters, this is not a D vs R issue. This is a Washington vs the People issue. Government spending needs to come down around 30% at least, and neither of the parties is the least bit interested in seeing that happen. Please work hard to vote anyone currently holding Office out of it and replace them with someone who has at least a bit of common sense. Wait until those 150 million workers get laid off due to sequestration. Maxine Waters is an offensively stupid pig, and much of the problem. A 50% reduction in federal expenditures would not be unreasonable. Pet peeve: The Senate is part of congress, the other body is the House of Representatives the term Congress refers to both together. I also hate it when the media refers to Senators and Congressmen. Senators ARE Congressmen. The correct phrase would be Senators and Representatives. Exactly. They usually do this as a reference to isolate (even subconsciously) Republicans from "the reasonable branches" in their warped view. Think it's sorta like the "pound of flesh" deal. It matters what part you cut off. Sorry, I meant Democrat leftist pig, with lots of unearned and undeserved power. No, wait until the foodstamps are cutoff. 410, 12, or 20 gauge? Very well done. The graph makes it much more clear than reams of text about small percentages. Well, you are a magnificent creature and you do not deserve to be mistakenly called the wrong names. In this case, a bot. You are not a bot, but a wonderful human and I respect you for that. You are only describing one of the objects. Wow! Let's go back to 1925 levels. The days of Silent Cal. The scary thing about it? It wasn't until this last week that conservatives figured out that they were being lied to...and some conservatives still haven't figured it out. In short, many, if not most conservatives were running in circles screaming and shouting that sequestration was going to end the world. Conservatives were buying into -and spreading- the Dem and MSM propaganda. ...but, we hate Dems and the MSM and we know that they always lie to us. Yeah. We're the smart ones in the room. 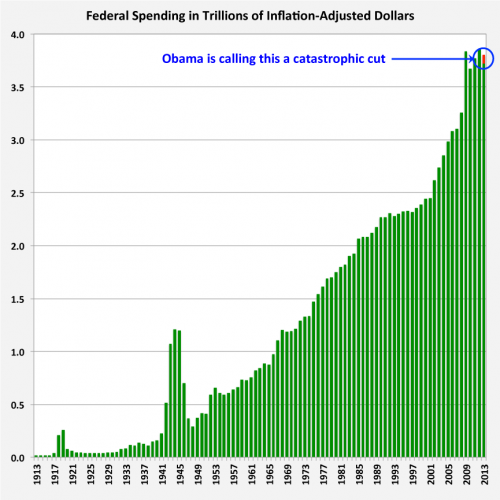 I would be happy if the government just froze spending to pop increase + inflation. That would be 2.75% this year - vs 7% without sequester and 4.8% with. My understanding is if we did this then the deficit would be around zero in must 7 years.